Yearning to start gardening, despite the winter temperatures? 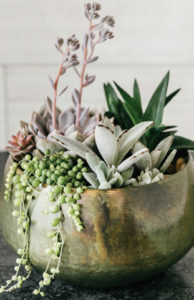 Consider trendy, exotic-looking succulents, the perfect green option for this time of year. But why succulents? 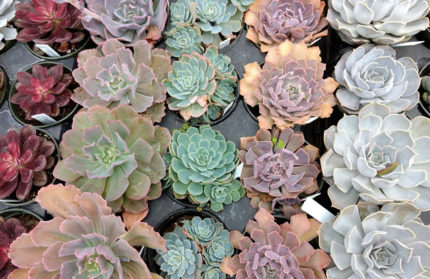 Succulents are available in a broad range of tender and hardy varieties from garden centers in our area such as Vault + Vine in Philadelphia and other locations in the western suburbs. You’ll find different colors, shapes and sizes of succulents, letting you design your own combinations in planters or terrariums. 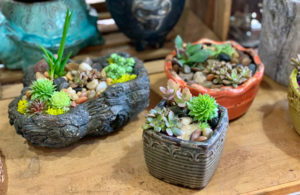 Check out Mostardi Nursery in Newtown Square and Matlack Florist in West Chester, which sells individual succulents as well as arrangements like Succulent Trio or Simply Succulents. When selecting plants for your home or office, consider the intended location. Some popular tender (indoor) types include aloe, crassula, jade and kalanchoe, while hardier varieties—such as sedums and sempervivums (hen-and-chicks)—can withstand some frost and add interest to outdoor gardens. A tip to help relieve the winter doldrums is to experiment with these striking plants, using them solo or mixed in decorative containers that complement their unique look. Make sure to use containers with good drainage, along with the specially-blended, well-aerated soil that’s formulated for succulents and cacti. Then place the plants in a location that gets 6–12 hours of bright, indirect light per day, such as a south-facing window. Use great restraint in watering (water only enough to dampen the soil, every 10 days or even longer). Smaller succulents can also be grown in an open terrarium as a miniature garden. Closed terrariums are too humid of an environment for these plants. Whether planted solo or in clusters, succulents will provide you with an interesting indoor winter gallery to admire year-round.